For those just beginning their college career, I’m sure the dreaded term “Freshman 15” has already been uttered. While this number is inflated, the reality is that over the course of one’s college career, weight gain is likely to occur, just more to the tune of 5 to 10 pounds. Rather than starting the school year thinking the odds are stacked against you, a few simple tips make this one course you can Ace while keeping your energy high and weight in check! Start Your Day With Breakfast: It’s easy to skip breakfast, especially with those early morning classes, but you’ve just come off potentially 6-8 hours with no food, and your body needs this nourishment to get through the day. Try an omelet, cottage cheese, or plain yogurt with fruit to boost protein intake and have sustainable energy throughout the day. 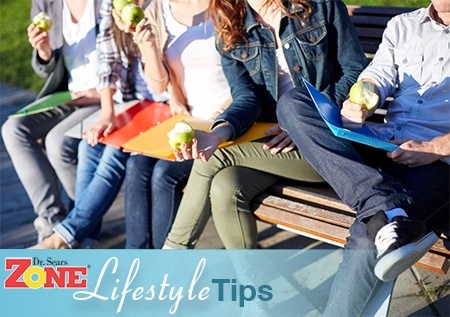 Eat Small, Frequent Meals Throughout the Day: By eating regular meals throughout the day, perhaps 3 meals and 2 snacks, you’ll keep your blood sugar constant, eliminating the urge to run to the University café for a coffee and pastry mid-afternoon. Avoid the Simple Carbs: When the majority of our diet is made up of simple carbohydrates in the form of candy, pastries, desserts, breads and pastas; it can wreak havoc on our bodies between making us fatigued and hungry and causing our blood sugar to rise and fall rapidly. It’s the hormonal imbalances from eating these foods that packs the pounds on and keeps them on. Moderate Your Alcohol Intake: While avoiding alcohol is unlikely for most, limiting intake or the number of drinks at a time may be. Stick with light beers as opposed to sugar laden-beverages that pack on a big calorie punch. (Long Island Iced Tea, 8oz. 275 calories!) Try to couple your alcohol intake with some type of protein (boneless chicken wings) to stabilize blood sugar and prevent alcohol-induced hunger. One of the big culprits in the weight-gain department is the late-night food order after a night of drinking. Not only do you have all the calories from the alcohol, but you might add on another 500-1,000 in food. Typically, it takes so long for the food to arrive that you’ve either fallen asleep or aren’t even hungry when it gets there! Opt to have a few lighter snacks on hand so you can have a small bite and go to bed instead. Drink Water: If you ignore the previous instruction to avoid alcohol, at least counter dehydration with water. Studies show that drinking at least 16 ounces of water before a meal can curb your caloric intake at that meal. It’s tempting to have soda or energy drinks for those late nights, but all these do is make you jittery and add on pounds. If you’re eating consistently throughout the day and making sure you have protein at each meal, you’ll be able to breeze through those late nights and retain more. Know How to Navigate the School Menu: When selecting an entrée, choose one that isn’t drenched in dressings, cream based sauces or cheese. Look for these key words when ordering as most likely it means they are healthier choices: Baked, Broiled, Boiled, Poached, Steamed, Roasted, Grilled, Stir-fried. Choose an entrée with lean protein like chicken or fish and ask for extra vegetables in place of starches or bread. For salads, add chicken, fish or even steak on top for protein and get the dressing on the side. Off-campus dining or eating-in: It seems like the cafeteria loses steam part way through the year making off campus dining enticing or resorting to peanut butter and jelly or cereal instead. Don’t fall into this trap. Many colleges offer grab-and-go choices, which are healthy. Some universities have sushi to go or will serve hot entrees to go. If are bringing it back to your room, grab a broth-based soup, a grilled chicken Caesar salad (be mindful of the dressing), or a turkey, tuna, or chicken sandwich (watch the condiments and go for a wheat wrap or eat it open faced). Grab a yogurt, cheese sticks and fruit as snacks to fuel you through the late-night studying that awaits you. Stay active: Pending how big your campus is, it’s easy to get in the habit of taking the bus, especially when the winter months kick in, and the campus feels like a wind tunnel. Fight the urge to become sedentary by walking to your classes, parking your car far away, and maintaining your gym routine. Avoid the Mindless Eating: Avoid having food around when you are prone to not be aware of how much you are actually consuming. Try not to have huge bags of chips or snacks around when studying as you’ll finish the bag without even knowing it. If you feel the need to have a bite, portion it out so that you know how much you’re getting or take a break and step away from the books so you are at least mindful of what you’re eating. Get on the scale: You might have to pop into the gym to do this, but hopping on the scale at the same time each week is helpful to monitor trends. Establish a red zone. Once the scale hits the 5lb mark, you know you need to start cutting back or changing habits. Knowing your number keeps you in check and keeps you being completely flabbergasted when you go home for break only to learn that you’ve gained 5-10lbs!